Training during a competitive season, in the off-season, recreationally, or for some other purpose requires commitment, sacrifice, and desire. You have been told nothing should get in your way of giving 100 or even 110%, at all times. However, it was less than 5 years ago that coaches still saw water breaks in football practice as a sign of weakness. Let that sink in a little. After you have, maybe you could consider there might be other practices you are currently practicing that are just as outdated. There’s health in balance and strength in recovery. Without adequate recovery, all that carnage in the weight room or field of competition leads to is pain or injury. Over time, your workouts plateau, the muscle soreness lasts longer, a loss of energy surrounds you--yet you can’t sleep, your motivation and focus has taken a big step backwards, and you’re starting to notice you’re sick more often than you used to be. So what does “recovery” look like? How can you increase your ability to recover from grueling workouts? How can you prevent pain and soreness from hanging around? How can you get back to feeling like exercise is actually good for you? “Performance is all about fuel. Different populations (endurance, strength, power, age etc.) require different interventions. Your nutritional intake should reflect your goals for training. The timing can be just as important as anything else. Following intense exercise the body is primarily in a catabolic state (breaking substances down). Cortisol (stress hormones) is elevated and muscle glycogen (fuel stores) is low/depleted. 1 So replace what you've used and encourage nutrient absorption. Notice that there is a dotted line between the protein and whole grains section indicating to increase protein portions and decrease carbohydrates slightly for weight management. As training intensity and duration increases, so do your needs for carbohydrates. You’ll notice that the fruit has been moved to the side of the plate to make room for the extra grains needed at mealtime. On a hard training or race day, it’s crucial that you are replenishing energy stores to help your body recover faster and more efficiently so that you can bounce back and can continue with your training. There are many considerations when choosing a protein, and there is plenty of research out there. So please seek out more information when choosing one. We suggest the gluten free, organic, whole food Whey Pro Complete from Standard Process. Spend the extra money on quality protein if you are going to supplement. Many will suggest you try to get your protein through diet, but studies suggest timing is of utmost importance (supplement both before and after for maximum muscle growth and recovery). Numerous studies have indicated that many proteins have fillers that suggest higher amounts of protein than actually present. Others suggest high amounts of heavy metals, which can be very damaging to overall health. Remember the reason many are working out is for improved health and greater quality of life, protein supplements with fillers and heavy metals do the opposite. Lastly, whey protein can improve blood pressure, reduce inflammation, beneficial for inflammatory bowel disease, help treat type 2-diabetes and the effects of high blood sugar and impaired function of insulin, enhance antioxidant defenses (reduce oxidative stress), reduction of LDL (bad) cholesterol, and it has a filling affect. All in all, whey protein supplementation has a positive affect on the stresses of workouts, competition, and injury healing. One of the most important nutrients necessary for an athletes overall health is essential fats. Fats are an energy source, essential for a fully functioning nervous system (great for brain health and hormonal functions), increase vagal tone (which we will touch on more later), decrease cortisol, associated with lower levels of inflammation (more omega-3’s than omega-6’s), reduce muscle soreness, lower triglycerides, improve tissue and joint healing,4 and improve gut health (heaving lifting is associated with increased episodes of leaky gut). Sources include: fish oil, cod liver oil, flaxseed, walnuts, chia seeds, dark leafy greens and eggs (among others). We can no longer discount the value of a healthy gut and probiotics can help. Probiotics should be taken nearly across the board. More and more research continues to come out about your gut ecosystem. We have only scratched the surface on the importance of gut microbiome (diversity). There is a direct link between gut health (diversity of bacteria in digestion organs) brain health and overall health. Micronutrients such as calcium and phosphorus (especially for women), vitamin D, potassium, zinc and magnesium are beneficial to all athletes. These will be best absorbed through diet. Stress affects us all differently, but our bodies tend to react the same way. And it's bad! Physical, emotional, and even perceived. Some stress is short lived, episodic or chronic. All of which, need to be managed accordingly. We talked earlier of the vagus nerve. The vagus nerve connects your brain to many important organs throughout the body, including the gut (intestines and stomach), heart, and lungs. It is a key part of your parasympathetic (rest and digest) nervous system. It influences your breathing, digestive function, lung function, and heart rate, all of which can have a huge impact on your mental health. Vagal nerve stimulation can be associated with treating many of the mental health signs of overtraining. Stimulate your vagal nerve with: cold exposure, deep and slow breathing, meditation, yoga and tai chi, massage, laughter, zinc, omega-3’s or intermittent fasting. Treating stress effectively helps everything in the body work at it's optimum. Workout-specific stress is generally good. Though it creates oxidative stress, the body is more efficient at cleansing out the bad by-products of exercise included with daily stress. Aside from that, if your technique or movement quality is lacking in any way you are adding unnecessary stress to ligaments and joints, which can lead to injuries, decreased activity, the need for surgery and more. Take steps (talk to a movement specialist, strength coach, or personal trainer) to make sure that your workouts and goals are healthy ones. Other steps could include deload week, proper periodization, and no sport specialization for young athletes. Clippers (NBA) players rely on yoga pregame. 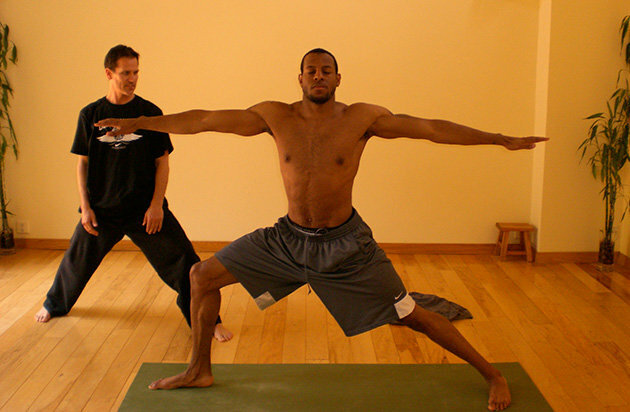 NBA players like Andre Iguodala (pictured), Dirk Nowitzki, Lebron James, Kevin Love and many others have all reported benefits of adding in yoga to their routine. We take movement serious and provide balance and options, contact us for help with your workouts or pain. Easily one of the most misunderstood, overlooked, and undervalued tools in the recovery tool belt. Rest is where most of the actual healing takes place. Eight to ten hours of sleep is required through high school. Adults may decrease their need by a few hours incrementally, but almost no one is getting enough sleep unless they’re getting closer to those vital eight hours. The list of possible interventions anymore is limitless. New technologies, new research, and new (and old) ideas lead to bigger, better, stronger. In addition to those that we mentioned in association with vagal nerve stimulation here are a list of therapies you might consider to improve your recovery and workout/training program. 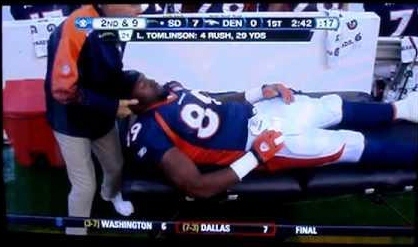 Many athletes rely on chiropractic care. 32/32 NFL teams have a team chiropractor. Sports Chiropractic care – Certified Chiropractic Sports Physicians® or Diplomate American Chiropractic Board of Sports Physicians® have extensive knowledge and experience on sports and recovery, movement assessments, access to many different therapeutic modalities, and understand proper utilization. Chiropractors use spinal adjustments to improve spinal integrity. Improving the way the spine is stabilized allows muscles to work with you instead of against you, thereby decreasing stress. Some of those modalities include: manual adjustments/therapy, laser therapy, vibration therapy (localized or whole-body), cryotherapy, compression therapy, kinesio-tape, Dynamic tape, cupping, corrective exercise, breathing assessments, and many more. For more consideration on these therapies, talk to your local sports chiropractor. NBA player Tony Parker foam rolling. Hamstring lockouts are a great way to finish a workout. Post-exercise/competition considerations are slightly different. Time your nutrition/hydration accordingly, do some rolling and/or stretching, joint mobilization, massage, vibration therapy, active recovery day after, or compression therapy are all valuable interventions. The benefits range from decreased soreness, downregulation of stress response, improved range of motion, improved tissue healing, and improved next-day performance (which can be extremely important for those long tournament weeks). Many are taking to technology to track their sleep, heart rate, steps, estimated caloric burn, etc. A new fitness tracker estimates your quality of sleep to advise on your workout level of exertion. Many have noted how beneficial it has been to improve their workouts by doing less on some days. Symptoms range from individual to individual and the presentation of one symptom alone does not necessarily indicate that you are over trained. As a result, the list below is not exhaustive. Nevertheless, any combination of the following may suggest that you are over trained, or in the very least in need of some recovery time. The first step is recognition of symptoms. If symptoms aren’t present than consider this a guide to prevent over training and start improving your recovery methods today. If you are experiencing any of the above symptoms, the most important thing to do is stop training. Your body needs time to recuperate. Listen to it. Symptoms could take days, weeks, or months to subside. Recognize potential avenues and tools for recovery. Seriously consider your diet and everything you are consuming. Reconsider goals and set up a new plan of attack. For more on how we can help at Chiro|Sport, please contact us to review your goals and ways in which we can help. 1. Nieman, David C. “Exercise, Heavy Exertion, and Immune Dysfunction.” Encyclopedia of Lifestyle Medicine & Health, doi:10.4135/9781412994149.n129. 2. Andersen, L.L., Tufekovic, G., Zebis, M.K., Crameri, R.M., Verlaan, G., Kjaer, M., Suetta, C., Magnusson, P., Aagaard, P. The effect of resistance training combined with timed ingestion of protein on muscle fiber size and muscle strength. (2005). Metabolism Clinical and Experimental, 54, 151-156. 3. Lemon, Peter W.r. “Beyond the Zone: Protein Needs of Active Individuals.” Journal of the American College of Nutrition, vol. 19, no. sup5, 2000, doi:10.1080/07315724.2000.10718974. 5. West, N.P., Pyne, D.B., Peake, J.M., Cripps, A.W. Probiotics, immunity and exercise: A review. Exer Immunol Rev. 2009: 15-107-26. 6. Almekinders, L. An in vitro investigation into the effects of repetitive motion and non-steroidal anti-inflammatory medication on human tendon fibroblasts. American Journal of Sports Medicine. 1995; 23:119-123. 7. Mackey AL, Kjaer M, Dandanell Jørgensen S, Mikkelsen KH, Holm L, Døssing S, Kadi F, Koskinen SO, Jensen CH, Schrøder HD, Langberg H. The influence of anti-inflammatory medication on exercise- induced myogenic precursor cell responses in humans. J Appl Physiol In press. 8. Warden, SJ. Prophylactic misuse and recommended use of non-steroidal anti-inflammatory drugs by athletes. British Journal of Sports Medicine 2009;43:548-549. 9. Wijck, Kim Van, Kaatje Lenaerts, Annemarie A. Van Bijnen, Bas Boonen, Luc J. C. Van Loon, Cornelis H. C. Dejong, and Wim A. Buurman. "Aggravation of Exercise-Induced Intestinal Injury by Ibuprofen in Athletes." Medicine & Science in Sports & Exercise 44, no. 12 (2012): 2257-262. doi:10.1249/mss.0b013e318265dd3d. 10. Tipton KD, Wolfe RR. Exercise, protein metabolism, and muscle growth. Int J Sport Nutr Exerc Metab. 2001;11:109–32. doi: 10.1123/ijsnem.11.1.109. 11. Ebrahim, I, Shapiro, C, Williams, A, and Fenwick, P. Alcohol and sleep I: Effects on normal sleep. Alcoholism, Clinical & Experimental Research 37(4): 539-549, 2013. 12. Milewski, M., Skaggs, D., Bishop, G., Pace, J., Ibrahim, D., Wren, T. and Barzdukas, A. (2014). Chronic Lack of Sleep is Associated With Increased Sports Injuries in Adolescent Athletes. Journal of Pediatric Orthopaedics, 34(2), pp.129-133. 13. Luke, Anthony, et al. “Sports-Related Injuries in Youth Athletes: Is Overscheduling a Risk Factor?” Clinical Journal of Sport Medicine, vol. 21, no. 4, 2011, pp. 307–314. 14. Lamberg L. Sleep May Be Athletes' Best Performance Booster. Psychiatric News. 2005. Volume 40, Number 16. 15. Mangine, Gerald T et al. “The Effect of Training Volume and Intensity on Improvements in Muscular Strength and Size in Resistance-Trained Men.” Physiological Reports 3.8 (2015): e12472. PMC. Web. 20 Aug. 2017. 16. Dickerson, Chris et al. “IMMEDIATE EFFECTS OF LOCALIZED VIBRATION ON HAMSTRING AND QUADRICEP MUSCLE PERFORMANCE.” International Journal of Sports Physical Therapy 7.4 (2012): 381–387. Print.